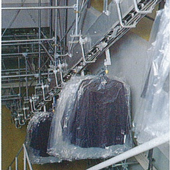 The Tsubaki Speed Rail System can efficiently carry hanging products from apparel makers between different floors and levels. 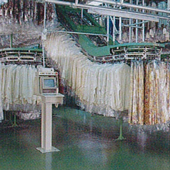 The system can divert and merge the flow of products in a highly flexible manner, making it possible to sort and store products in multiple directions and places. Employing an extendable rail, Telesco Beam facilitates the unloading of items from hanger vehicles with greater work efficiency. 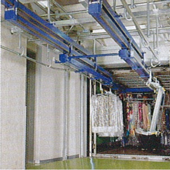 The chain feeder allows for hanger transfer between floors. 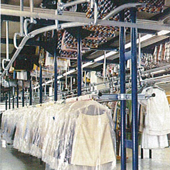 Each link of the chain is fitted with a hook to which trolleys can be automatically set or removed. This system facilitates picking work while enhancing storage efficiency. 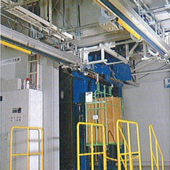 The Hi Trolley systems provides efficient sorting and level-to-level conveyance, In addition to conveying items by trolley, items can also be conveyed vertically on cargo vehicles.